Traffic is controlled in coastal waters and inland passages with marker buoys. 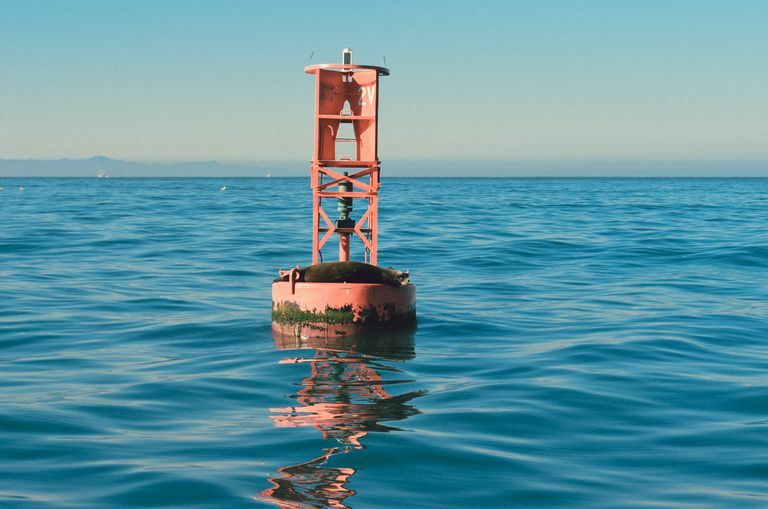 Buoys in coastal areas are known as lateral markers and when found in traffic lanes they are known as channel markers. Both types of markers serve the same purpose. They guide a vessel through an area known to be safe for passage, and provide a traffic separation scheme similar to a road on land. These “Rules of the Road” are very similar to those you follow while driving an automobile on land, so we will use that as an example when talking about marine traffic. If you are driving a car in an overseas country it is sometimes necessary to drive on the opposite side of the road than you usually do. This is the same for ships, but fortunately there are only two schemes IALA A and IALA B. IALA stands for International Association of Lighthouse Authorities. IALA A is used in Europe, some areas of Africa, most of Asia, plus Australia and New Zealand. IALA B is used in North America, South America, Japan, the Philippines, and Korea. Marker buoys come in two colors, green and red. Red buoys mark one side of a traffic lane and green marks the other side. Think of the area in the middle as a road or highway. On land a road has painted stripes marking safe areas for travel; a solid line marks both sides of the road and is meant not to be crossed—think of the red and green buoys as these lines. A road has a line painted in the middle to divide traffic by direction; in a maritime environment the center divider is invisible. The separation line is exactly in the center of the marked course. In Europe, Australia, New Zealand, plus parts of Africa and Asia, the IALA A rules are in force. This means that when traveling you should keep the green buoy on the right or starboard side of the vessel. The shape of the marker also gives you traffic information. A triangular or cone-shaped top indicates the marker should be kept on the starboard side of the vessel. The IALA B traffic separation scheme is used in North and South America, Japan, the Philippines, and Korea. It is the opposite traffic flow of the IALA A scheme. This is like driving on the opposite side of the road while overseas. In this case, while traveling keep the red buoy on the right or starboard side of the vessel. The same triangular or cone-shaped top will be present on markers which should be kept on the starboard side of the vessel. Both traffic patterns have the same rules when it comes to marker shape. A triangular marker is always kept on the starboard side of the vessel no matter if it is red or green. Markers to the port side of the vessel will be square or flat-topped. When entering a traffic separation area, proceed with caution and be alert. This is like a highway on-ramp for ships and smaller craft. At busy times many vessels will be trying to enter these lanes. Try to align your vessel in the direction of travel within the lane. Essentially extending the lane beyond the actual lane markers will help you smoothly transition from open waters to the traffic lane. The entrance to a traffic separation scheme is subject to rules of Right of Way. The Right of Way is one of the most important parts of the Rules of the Road and needs to be understood completely for safe operation. Sometimes automobile traffic in busy areas takes on a special set of rules that is different from standard operation, and is usually only understood by local drivers. The same thing is true on the water. Local vessels like water taxis or tender boats might not follow these traffic lanes, this is not necessarily breaking the rules because the vessels need to operate outside the lanes to do their job. Exiting a traffic scheme is similar to entering. If you are traveling out into open water it is best to extend your heading past the end of the final marker. If your vessel is large or slow moving, traffic behind your vessel might be eager to pass. Wait until traffic clears before changing your course because not all vessels will sound the proper horn signal when attempting to pass. Be careful, Right of Way is important, but avoiding collision is more important than being right. You may need to exit a traffic lane before reaching the end of the marked passage to reach your destination. Buoys are marked with numbers like street numbers. Red buoys always have an even number and green are marked with odd numbers. Maneuvering between marker buoys is acceptable as long as it can be done safely. Check for traffic outside the lane and for any orange and white buoys marking obstructions. If the way is clear you may proceed. If you must cross the oncoming lane of traffic, wait for an appropriate gap in traffic and turn a perpendicular course across the lane. Keep other vessels in mind when slowing down or turning out of a lane. Ships have limited maneuverability at low speeds and take a long time to stop. If you cannot turn across a lane without obstructing traffic, exit on the opposite side and wait for traffic to clear then proceed across both lanes to your destination. Where two traffic lanes cross there is a special marker buoy. It is striped horizontally with red and green bands. This is similar to an intersection of a primary and secondary road. The top band designates the primary traffic route and the lower band designates the secondary route. Right of Way rules govern how traffic flows at these crossings—primary and secondary designations do not determine which vessel may cross first. Do You Want Your Captain's License?